20 photos of the 76cm gauge heritage line run by the Waldviertler Narrow Gauge Railway Preservation Society (WSV) between Heidenreichstein and Alt Nagelberg in Lower Austria. Welcome to the Rocking Rock (= Wackelstein) Express! Heidenreichstein, Sun 1 February 2015. The Wackelstein Express takes its name from the rocking or balancing rocks to be found in the Blockheide nature reserve near Gmund. 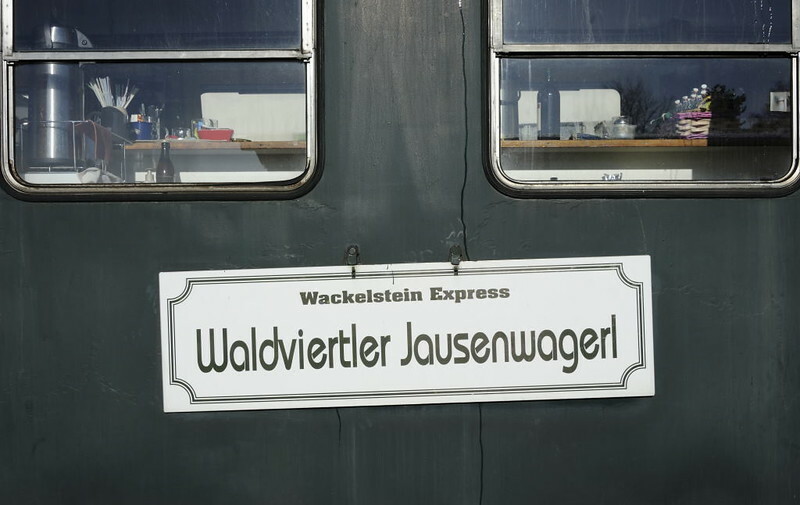 It applies to the trains run by the Waldviertler Narrow Gauge Railway Association (WSV) on their 76cm gauge line between Heidenreichstein and Alt Nagelberg. The WSV have run trains since 1993, initially using industrial diesels, now former Austrian Federal Rlys (OBB) class 2091 diesel-electrics dating from the late 1930s. Trains run in the summer and on special occasions and holidays.